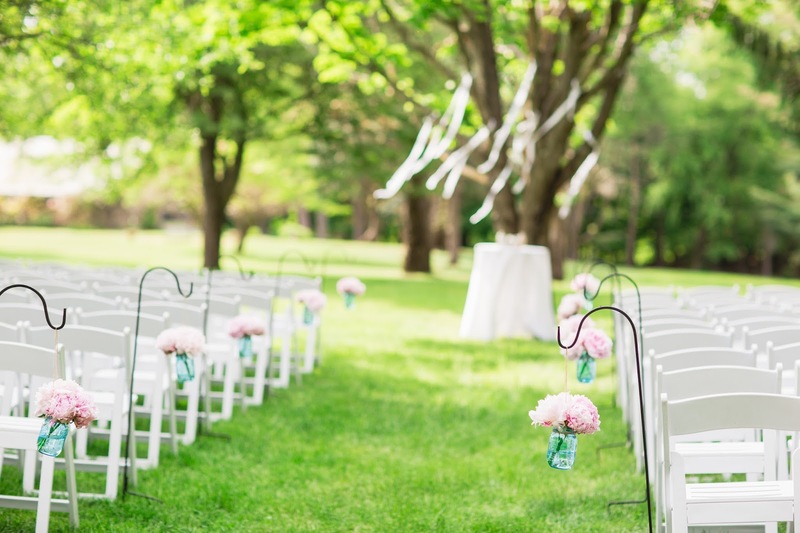 Flowers are one of the most expensive part of a wedding. I love flowers but it's hard to justify spending that much (especially with wedding markup) on something that will wilt and die in a few days. 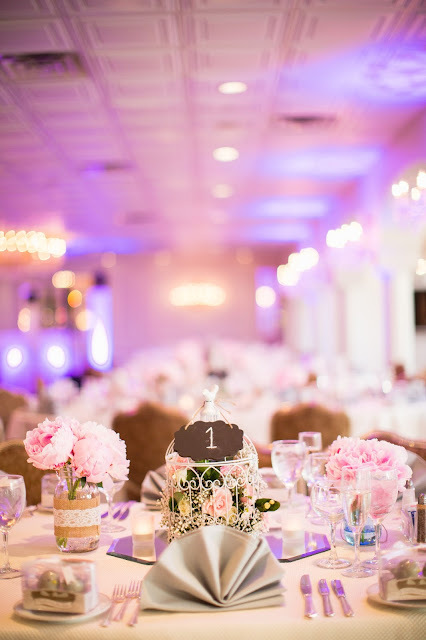 I decided to order wholesale flowers instead of using a florist for my centerpieces to save money. I am not a florist but I can be creative so I needed to think of a design that is simple yet impressive. My rustic venue made it a lot easier to go with a DIY route. If I had gone with a grandiose venue, a simple DIY centerpiece may not have looked that great in comparison. I ended up ordering from 3 different websites because they gave the lowest price on the specific flower I wanted in my decor. I will review each one and talk about how I worked with these fresh flowers for the wedding day. To go with my "Love Bird" theme, I chose birdcages as the focal point. They were then paired with a DIY burlap and lace quart mason jar and a blue pint mason jar on each side. It was random yet harmonious. I bought 12 birdcages for $10 each (using 50% coupons for Michael's craft store) and then spray painted them white. The mason jars were bought on Amazon and on sale at Michael's. I ordered their "Make Your Own Flower Centerpieces Combo Box". One order came with 40 stems of spray roses, 2 bunch of white aster, 2 bunches of green hypericum, and 2 bunches of ruscus. This would be perfect for me to fill up my birdcages with. It is inexpensive and gives a variety of fillers. I was unsure if 1 order would be enough for my 12 birdcages so I made 2 orders, one with light pink spray roses and one with cream spray roses. I had no idea how many rose buds 40 stems would have, so when they arrived I realized 1 stem had FIVE to SIX roses on it. This was a lot more than I expected. But the buds were pretty small, so the leftover wasn't too bad. As directed on the site, I ordered for them to arrive 3 days before the event. I think I should have done 4 days because there was a lot of buds that weren't fully opened by Saturday when I was arranging them, especially the cream ones. I trimmed all the flowers as soon as they arrived on Thursday morning and put them in water with some plant food. I changed the water every day hoping to keep the flowers fresh and bloom faster. Two orders cost $190. I used a 5% discount code I got for signing up for their newsletter. Fiftyflowers had the best customer service. A customer representative called me to confirm my order soon after I made it. My original plan was to use only baby's breath in the birdcages. I found that Costo sold Baby's Breath for the best deal online. I made a test order a month in advance to see how many birdcages 1 order of 100 stems would make and to practice arranging them in foral foam cubes. I was able to use the leftovers for my bridal shower (yay 2 in 1!) I love the simplicity of just baby's breath but my family thought otherwise. They suggested to use some other flowers to make it more interesting. So I'm glad I did this trial because the final results with the spray rose combo box mixed with baby's breath really did make the centerpieces stand out more. I had a lot of baby's breath left after using them in the birdcages. I made a bouquet of them in a galvanized tin to put next to our Love Story Board and also trimmed 100+ sprigs of them to bring to the venue on Sunday. I had the groomsmen help slip a sprig of baby's breath onto my menus which were tied with a mint twine ribbon. It was the perfect finishing touch. My wedding order plus the trial order cost a total of $192. 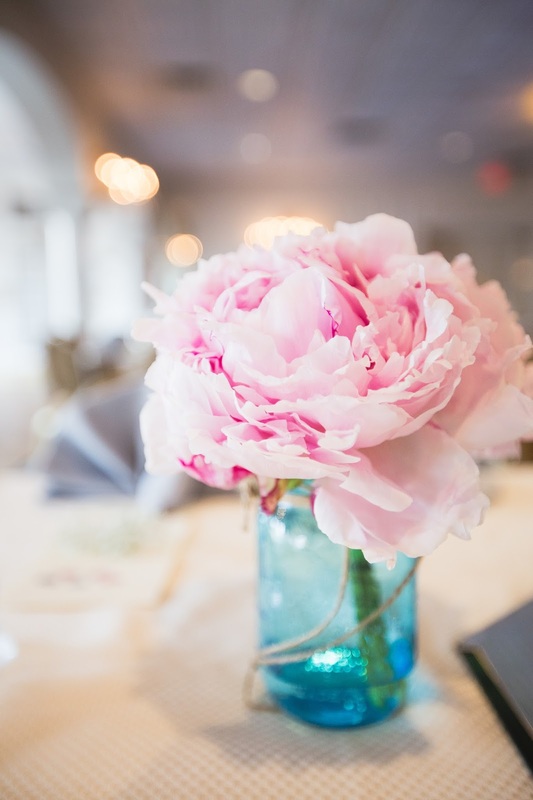 I really wanted to include Peonies as a focal point of my flowers because they are so fluffy and romantic. They are also going to be used in my bouquet made by my florist. Peonies were pretty expensive in comparison to other flowers. An order of 100 cost $310. They also offered a 5% discount when you sign up. 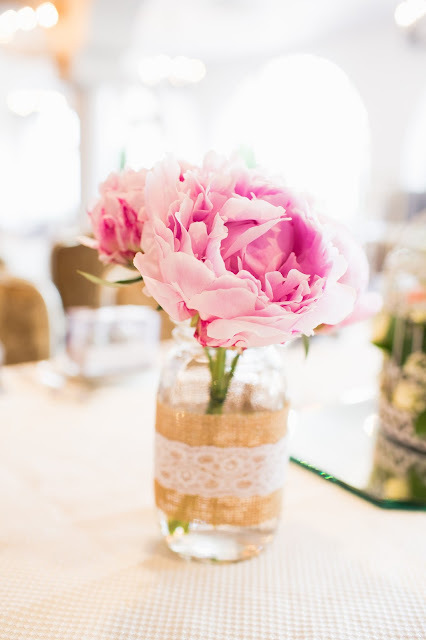 I averaged 3 peonies per mason jar which will use about 72 peonies. Which worked out perfectly because there was a good amount of peonies that did not bloom. Luckily this order unexpectedly came a day early on Wednesday. I was worried when they arrived in round bulbs, if they would all bloom in time. It was really nice to see them bloom more and more each day. My blue mason jars had a dual use. 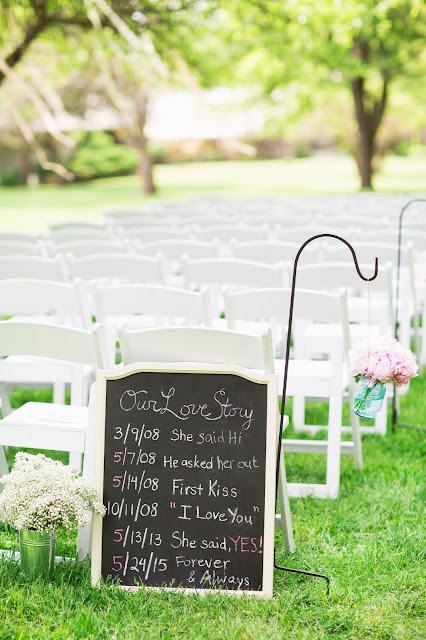 I gave instructions to have them hang on shepard hooks during the ceremony. After the ceremony, they were moved reception tables. This is a great idea to save money and still look very put together.